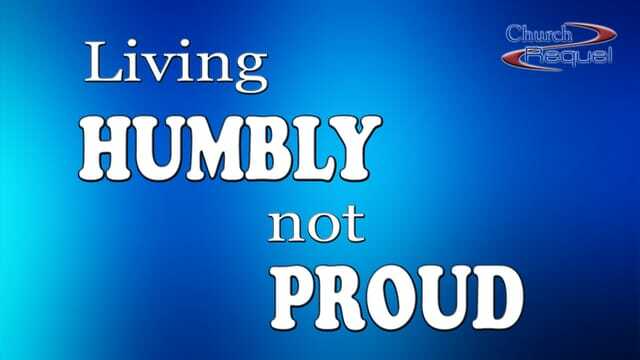 We continue our 2019 mini-resolution series with today's topic, "Living Humble Not Proud." We know we are supposed to be humble and not proud, because the Bible tells us this. We know humility is a basic Christian lifestyle theme. But are there good reasons why I want to live humbly? Are there advantages to the humility lifestyle? What is humility, after all? If it's something that I should do and something I want to do, how do I live humbly? What strategies can I practice to help me live more humbly? These are the challenges we attempt to discover in today's sermon and to practice in the month of March. If we are honest we struggle with this.Ben Franklin admitted his struggle with pride. Listed 12 virtues. Quaker friend suggested humility. There is, perhaps, no one of our natural passions so hard to subdue as pride. Disguise it, struggle with it, beat it down, stifle it, mortify it as much as one pleases, it is still alive, and will every now and then peep out and show itself; ...for, even if I could conceive that I had completely overcome it, I should probably be proud of my humility. These are all virtues that don't come naturally, especially humility. The Bible tells us that we have to clothe ourselves. "Put On." The outer layer. (1) Remember. (2) Cover up. (3) Ok NOT to be transparent. (4) Try/effort. What is humility? It's not putting yourself down. Not assuming worst comparisons of yourself verses others. Not low self esteem. Realizing that YOU aren't center of the universe. Everything doesn't revolve around you. But around God. When we assume everything revolves around us we take on the role of God. Easier to be our true selves with true humility. It's serving others in every position we're in. Even leaders serve! #1 - So God will be ____________________ . We've said you can't outliveGod, but you also can't outmock Him! You think you have reason to be proud? Wait until you're in front of God! A repeat of 2 things. (1) God shows favor. (2) Clothe yourselves. Have you considered that the virtues you wear are more important than the clothes you wear? When you get dressed in the morning, you decide what clothing you will put on. Peter is affirming that choosing to dress yourself with humility every morning is even more important! #2 - So God will _____________________ . God is a better lifter than we! (1) Note again the repeat of God favors! (2) Those of us who are proud, brag on ourselves. Ask yourself: Who would you rather have bragging? Two Harvard neuroscientists (2012) have discovered that talking about ourselves gives us the same pleasure as intimacy and food! Why we do it? We want to feel valued / important. Let God give that to you! Bragging is poor compliment! But when others compliment, humble to say "thanks"
#3 - So God will ________________________ . Humility is important part of prayer life. Humble myself in this context literally means a comparison of myself with God's holiness. What happens when we "seek His face." Right position/attitude before God. Consider that this means God doesn't hear the one with the right religion/ theology. It's not a matter of correct faith as much as correct humility! #4 - So I will ____________________ to handle challenging situations. Wisdom is applied knowledge. It's not smarts and it's not knowledge itself. Lots of smart people are foolish - not wise! And it's not a matter of knowing more. Wisdom is knowing what to do in any given situation. It's matching what you know with what's happening - especially in tough circumstances. Why? Because with humility, we have the ability to seek help / advice both from God and other people. With humility we can admit we don't know what to do and we need help. #5 - So my relationships will be _____________________ . What is harmony in music? Isn't it the blending of differences in a pleasing way? In music, we might say "don't sing too loudly" but also "not too softly!" Listen to others. Match your voices. It's the same with living harmonious. We don't live in such a way that we consider ourselves better or worse. How do we accomplish humility when our natural inclination is to think of ourselves higher than someone else? To purposefully, with intention, value others more highly. This is the classic golden rule. With purpose, with intention to think of how we would like to be treated and then do that with others. We intentionally think of the interests of others. (We naturally do that with ourselves. We don't have to try to be selfish, but we do have to try to think of the interests of others.) This is such an important key to relationships. When others know how much you care about them, they will want to be around you!!! #6 - Because it's the true ____________________ . In 2011 Charlie Sheen redefined #winning after losing his job on 2 1/2 Men. Time Magazine put it this way: "participating in an ostensibly drug-induced, highly public flameout, during which one loses an incredibly lucrative job and, subsequently, the respect of the American people." In other words self-proclamations of #winning is a lot closer to losing! If you doubt this, go on web and search for #winning on Instagram - 15 million posts! Most don't look very victorious! If you want real victory, real winning means humility and then allowing God to give you the victory, to brag on you, to give you the hashtag, #winning!. Let God delight in you! Conclusion: Humility is not low self-esteem. It is correct self-esteem. God is the standard, not others. Each day we must be intentional about our correct position via God/others. Then let God lift us up!